^ a b c Stallman, Richard (2006-03-09). The Free Software Movement and the Future of Freedom. Zagreb, Croatia: FSF Europe. Retrieved 2007-02-20. Lay summary. ^ Yi Peng; Fu Li; Ali Mili (January 2007). “Modeling the evolution of operating systems: An empirical study” (PDF). Journal of Systems and Software (Elsevier) 80 (1): 1-15. doi:10.1016/j.jss.2006.03.049. オリジナルの2009-05-09時点によるアーカイブ。. https://web.archive.org/web/20160111035552/https://web.njit.edu/~mili/pdf/oss.pdf 2016年1月11日閲覧. "...we have selected a set of fifteen operating systems: Unix, Solaris/Sun OS, BSD, Windows, MS-DOS, MAC OS, Linux, Net Ware, HP UX, GNU Hurd, IBM Aix, Compaq/ DEC VMS, OS/2." ^ M. R. M. Torres; Federico Barrero; M. Perales; S. L. Toral (June 2011). “Analysis of the Core Team Role in Open Source Communities” (PDF). Complex, Intelligent and Software Intensive Systems (CISIS), 2011 International Conference on (IEEE Computer Society): 109-114. doi:10.1109/CISIS.2011.25. https://www.researchgate.net/profile/Federico_Barrero/publication/221328676_Analysis_of_the_core_team_role_in_open_source_communities/links/5464a5fb0cf2cb7e9dab30fe.pdf 2016年1月11日閲覧. 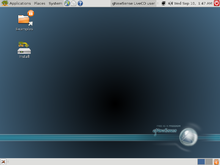 "Debian port to Hurd...: The GNU Hurd is a totally new operating system being put together by the GNU group." ^ Neal H. Walfield; Marcus Brinkmann (2007-07-04). “A critique of the GNU hurd multi-server operating system” (PDF). ACM SIGOPS Operating Systems Review (New York, NY, USA: Association for Computing Machinery) 41 (4): 30-39. doi:10.1145/1278901.1278907. オリジナルの2015-11-05時点によるアーカイブ。. https://web.archive.org/web/20151105213752/http://www.walfield.org/papers/200707-walfield-critique-of-the-GNU-Hurd.pdf 2016年1月11日閲覧。. ^ a b c St. Amant, Kirk; Still, Brian. Handbook of Research on Open Source Software: Technological, Economic, and Social Perspectives. ISBN 1-59140999-3. ^ Raymond, Eric (2001-02-01). The Cathedral & the Bazaar: Musings on Linux and Open Source by an Accidental Revolutionary. pp. 10-12. ISBN 978-0-59600108-7. https://books.google.com/books?id=F6qgFtLwpJgC. ^ Vaughan-Nichols, Steven J. "Opinion: The top 10 operating system stinkers", Computerworld（英語版）, April 9, 2009: "…after more than 25 years in development, GNU remains incomplete: its kernel, Hurd, has never really made it out of the starting blocks. […] Almost no one has actually been able to use the OS; it's really more a set of ideas than an operating system." ^ Hillesley, Richard (June 30, 2010), “GNU HURD: Altered visions and lost promise”, The H: 3, http://www.h-online.com/open/features/GNU-HURD-Altered-visions-and-lost-promise-1030942.html, "Nearly twenty years later the HURD has still to reach maturity, and has never achieved production quality. […] Some of us are still wishing and hoping for the real deal, a GNU operating system with a GNU kernel." ^ Lessig, Lawrence. The Future of Ideas: The Fate of the Commons in a Connected World, p. 54. Random House, 2001. ISBN 978-0-375-50578-2. About Stallman: "He had mixed all of the ingredients needed for an operating system to function, but he was missing the core." ^ Stallman, Richard (1986), “KTH”, Philosophy (speech), GNU, Stockholm, Sweden: FSF, https://www.gnu.org/philosophy/stallman-kth.html . ^ a b c Lambert, Laura (2005). Poole, Hilary. ed. The Internet: A Historical Encyclopedia. Biographies, Volume 1. Santa Barbara, California: ABC-CLIO. pp. 215-216. ISBN 1-85109-664-7. https://books.google.com/books?id=qi-ItIG6QLwC. ^ Holmevik, Jan Rune; Bogost, Ian; Ulmer, Gregory (March 2012). Inter/vention: Free Play in the Age of Electracy. MIT Press. pp. 69-71. ISBN 978-0-262-01705-3. https://books.google.com/books?id=jXC6H8lRjlUC. ^ a b DiBona, Chris; Stone, Mark; Cooper, Danese (October 2005). Open Sources 2.0: The Continuing Evolution. pp. 38-40. ISBN 9780596008024. https://books.google.com/books?id=q9GnNrq3e5EC&printsec=frontcover#v=onepage&q&f=false. ^ Seebach, Peter (November 2008). Beginning Portable Shell Scripting: From Novice to Professional (Expert's Voice in Open Source). pp. 177-178. ISBN 9781430210436. https://books.google.com/books?id=53zaxy423xcC&printsec=frontcover#v=onepage&q&f=false. ^ a b Kerrisk, Michael (October 2010). The Linux Programming Interface: A Linux and UNIX System Programming Handbook. pp. 5-6. ISBN 9781593272203. https://books.google.com/books?id=Ps2SH727eCIC&printsec=frontcover#v=onepage&q&f=false. ^ a b Open Sources: Voices from the Open Source Revolution. O'Reilly & Associates, Inc.. (January 1999). ISBN 1-56592-582-3. http://oreilly.com/catalog/opensources/book/tiemans.html. ^ Buxmann, Peter; Diefenbach, Heiner; Hess, Thomas (2012-09-30). The Software Industry. pp. 187-196. ISBN 9783642315091. https://books.google.com/books?id=LlCnYt2snHYC&printsec=frontcover#v=onepage&q&f=false. ^ Practical UNIX and Internet Security, 3rd Edition. O'Reilly & Associates, Inc.. (February 2003). p. 18. ISBN 9781449310127. https://books.google.com/?id=50maN7VmpusC&printsec=frontcover#v=onepage&q&f=false. ^ Matthew, Neil; Stones, Richard (2011-04-22). “The GNU Project and the Free Software Foundation”. Beginning Linux Programming. ISBN 9781118058619. https://books.google.com/books?id=vvuzDziOMeMC&printsec=frontcover#v=onepage&q&f=false. ^ Sowe, Sulayman K; Stamelos, Ioannis G; Samoladas, Ioannis M (May 2007). Emerging Free and Open Source Software Practices. pp. 262-264. ISBN 9781599042107. https://books.google.com/books?id=7MhTb9X4aYgC&printsec=frontcover#v=onepage&q&f=false. ^ McCune, Mike (December 2000). Integrating Linux and Windows. p. 30. ISBN 9780130306708. https://books.google.com/books?id=0SM3PEH9gagC&printsec=frontcover#v=onepage&q&f=false. ^ Sobell, Mark G; Seebach, Peter (2005). A Practical Guide To Unix For Mac Os X Users. p. 4. ISBN 9780131863330. https://books.google.com/books?id=o9K8KEQic5sC&printsec=frontcover#v=onepage&q&f=false. ^ Kavanagh, Paul (2004-07-26). Open Source Software: Implementation and Management. p. 129. ISBN 978-1-55558320-0. https://books.google.com/books?id=CHkHNChvPqIC. ^ “List of Free GNU/Linux Distributions”, GNU Project, Free Software Foundation (FSF), https://www.gnu.org/distros/free-distros.html . ^ “GPL 1.0”, Old licenses, GNU, FSF, https://www.gnu.org/licenses/old-licenses/gpl-1.0.txt . ^ a b Kelty, Christopher M (June 2008). “Writing Copyright Licenses”. Two Bits: The Cultural Significance of Free Software. ISBN 978-0-82234264-9. https://books.google.com/books?id=MEmMl-tY8jEC. ^ The History of the GNU General Public License, Free Software, http://www.free-soft.org/gpl_history/ . ^ “GNU’s flashes”, GNU's Bulletin, GNU Project (Free Software Foundation (FSF)) 1 (5), (Jun 11, 1998), https://www.gnu.org/bulletins/bull5.html#SEC7 . ^ Chopra, Samir; Dexter, Scott (August 2007). Decoding Liberation: The Promise of Free and Open Source Software. pp. 46-52. ISBN 978-0-41597893-4. https://books.google.com/books?id=c7ppFih2mSwC. ^ The origins of Linux and the LGPL, Free BSD, https://www.freebsd.org/doc/en_US.ISO8859-1/articles/bsdl-gpl/origins-lgpl.html . ^ Goldman, Ron; Gabriel, Richard P (April 2005). Innovation Happens Elsewhere: Open Source as Business Strategy. pp. 133-34. ISBN 978-1-55860889-4. https://books.google.com/books?id=2VElII9QeakC. ^ Smith, Roderick W (2012). “Free Software and the GPL”. Linux Essentials. ISBN 978-1-11819739-4. https://books.google.com/books?id=gmfFsdIAejkC.